Can an LCMS member commune at a non-LCMS church? What are the main differences between the LCMS and the ELCA? What has the LCMS stated about the theological differences between the LCMS and ELCA? What are the main differences between the LCMS and the WELS? With which worldwide church bodies does the LCMS have altar and pulpit fellowship? QUESTION: Is it wrong for a member of an LCMS congregation to receive Holy Communion at an ELCA church? Is it wrong for an ELCA member to receive Holy Communion at an LCMS church? In keeping with the principle that the celebration and reception of the Lord's Supper is a confession of the unity of faith, while at the same time recognizing that there will be instances when sensitive pastoral care needs to be exercised, the Synod has established an official practice requiring "that pastors and congregations of The Lutheran Church— Missouri Synod, except in situations of emergency and in special cases of pastoral care, commune individuals of only those synods which are now in fellowship with us." By following this practice whereby only those individuals who are members of the Synod or of a church body with which the Synod is in altar and pulpit fellowship are ordinarily communed, pastors and congregations preserve the integrity of their witness to the gospel of Christ as it is revealed in the Scriptures and confessed in the Lutheran confessional writings. 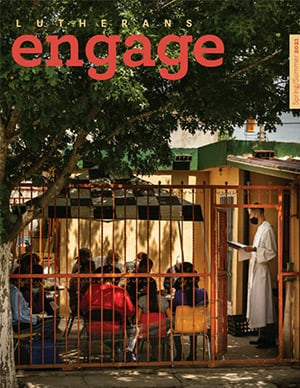 The Synod has not attempted to define precisely what constitutes "special cases of pastoral care," but it has entrusted to its pastors and congregations the responsibility to make judgments in individual cases about the propriety of communing non-LCMS Christians. "In accordance with the confessional nature of participation in the Lord's Supper, and in agreement with Lutheranism's historic position, it is inappropriate to attend the Lord's Supper at non-Lutheran altars. Since participation in Holy Communion, scripturally and confessionally understood, entails agreement in the Gospel and all its articles, it would not be appropriate to attend the Lord's Supper in a church with which such agreement is not shared." QUESTION: What are the main differences between the Missouri Synod and the Evangelical Lutheran Church in America (ELCA)? 1. The doctrine and authority of Scripture. The LCMS believes that the Bible is without error in all that it says. The ELCA avoids making such statements, holding that Scripture is not necessarily always accurate on such matters as history and science. Differences between the LCMS and the ELCA on the authority of Scripture also help to explain why the ELCA ordains women to the pastoral office, while the LCMS does not (based on 1 Cor. 14:33-36 and 1 Tim. 2:11-14). Similarly, on the basis of what Scripture clearly teaches (Rom. 1:18-28; 1 Cor. 6:9), the LCMS position on homosexual behavior is unequivocal: homosexual behavior is contrary to God's will, while the ELCA has declared that it lacks a consensus regarding what Scripture teaches about homosexual activity. Consequently, those who disagree with one another in the ELCA have been called to respect the ‘bound conscience’ of the others. The ELCA has also determined to allow the ordination of practicing homosexuals as long as they are in a life-long, committed relationship. 2. The commitment to Lutheran confessional writings. The ELCA, while affirming its commitment to the Gospel of Jesus Christ as witnessed to in the Lutheran Confessions, also tends to emphasize the historical character of these writings and to maintain the possibility of dissent to confessional positions that do not deal directly with the Gospel itself understood in a narrow sense. All LCMS pastors are required to affirm that the Lutheran Confessions are a correct explanation of the teachings of Scripture. 3. The level of agreement necessary to join together in one church body. While the LCMS believes the Bible requires agreement in all that the Bible teaches, the ELCA holds that disagreement in some matters of doctrine, such as the mode of Christ's presence in Holy Communion, do not prohibit church fellowship. QUESTION: What has The Lutheran Church—Missouri Synod (LCMS) stated officially about its differences with the theological position of the Evangelical Lutheran Church in America (ELCA)? In 1997 the Evangelical Lutheran Church in America (ELCA) adopted A Formula of Agreement which formally declared full communion with the Presbyterian Church (USA), the Reformed Church in America, and the United Church of Christ based on what is referred to as "a fundamental doctrinal consensus" (A Formula of Agreement, p. 19). Although this document acknowledges that "it has not been possible to reconcile the [Lutheran and Reformed] Confessional formulations from the sixteenth century" concerning the presence of Christ in the Lord's Supper, it contends that "these enduring differences" can be regarded "as acceptable diversities" and should therefore not be regarded as "church-dividing, but are complementary" (p. 20). The Lutheran Confessions, however, reject the Reformed position on the presence of Christ in the Sacrament (FC Ep. VII, 21-42; FC SD VII, 111-28), and they clearly affirm what the Scriptures teach, namely: "We believe, teach, and confess that in the Holy Supper the body and blood of Christ are truly and essentially present and are truly distributed and received with the bread and wine. We believe, teach, and confess that the words of the testament of Christ are to be understood in no other way than in their literal sense, and not as though the bread symbolized the absent body and the wine the absent blood of Christ, but that because of the sacramental union they are truly the body and blood of Christ" (FC Ep VII, 6-7). The compatibility of the Lutheran understanding of "the Christian as a being 'at the same time righteous and sinner' " and the Roman Catholic view that the inclination toward sin in the justified Christian is not really "sin in the authentic sense" (para. 30). It is clear that Roman Catholics and Lutherans have not yet resolved substantive points of disagreement over the doctrine of justification. Resolved, That the CTCR be asked to prepare an evaluation of the ELCA/Reformed A Formula of Agreement and the Lutheran/Roman Catholic Joint Declaration on the Doctrine of Justification for use in discussing these issues throughout the Synod. QUESTION: What are the main differences between the Missouri Synod and the Wisconsin Evangelical Lutheran Synod (WELS)? 1. The biblical understanding of fellowship. The WELS holds to what is called the "unit concept" of fellowship, which places virtually all joint expressions of the Christian faith on the same level. In an official statement made in 1960 the WELS states, "Church fellowship should therefore be treated as a unit concept, covering every joint expression, manifestation, and demonstration of a common faith" (Doctrinal Statements of the Wisconsin Evangelical Lutheran Synod, 1970, pp. 51-52). The LCMS, however, has historically not understood or practiced church fellowship in this way. Our Synod, for example, has made a distinction between altar and pulpit fellowship (for which full doctrinal agreement is required) and other manifestations of Christian fellowship, such as prayer fellowship (which do not necessarily require full doctrinal agreement). Disagreements on this issue led the Wisconsin Synod to break fellowship with the LCMS in 1961. 2. The doctrine of the ministry. With respect to the doctrine of the ministry, since the days of C.F.W. Walther our Synod has held that the office of the public ministry (the pastoral office) according to Scripture is the one divinely established office in the church, while the church possesses the freedom to create other offices, by human institution, from time to time to assist in the carrying out of the functions of the pastoral ministry. The WELS' Theses on Church and Ministry, however, expressly deny that the pastoral ministry is specifically instituted by the Lord in contrast to other forms of public ministry (see Doctrinal Statements, pp. 9-11; cf. the Commission on Theology and Church Relations' 1981 report on The Ministry: Office, Procedures, and Nomenclature. 3. The role of women in the church. 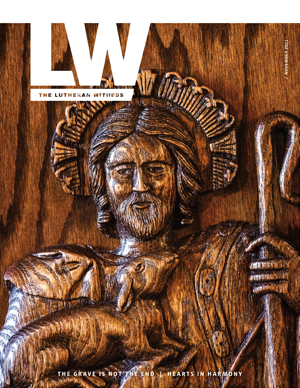 While both the LCMS and the WELS strongly oppose the ordination of women to the pastoral office on Scriptural grounds, the LCMS has concluded that the Scriptures do not forbid woman suffrage in the church. The WELS opposes woman suffrage in the church as contrary to Scripture. QUESTION: Where can I find a listing of the various worldwide churches in which the LCMS is in altar and pulpit fellowship? ANSWER: View a list of church bodies in fellowship with the LCMS. What about the anti-Semitic statements made by Luther? QUESTION: I was searching for an answer to my question and came across your web site so I will ask you. I have been going to an Assembly of God church for about 10 years. My husband's family is Lutheran, and my kids now attend their grandmother's church which is Lutheran. They love it! I was wondering if you would know what the differences are between the two churches. ANSWER: Let me first note there is much that the Assemblies of God and our The Lutheran Church—Missouri Synod (LCMS) have in common as Christian churches. Both have a high view of the Holy Scriptures as God's inspired Word, a belief in the doctrine of sin, and the doctrines of the Holy Trinity, the deity of Jesus Christ, and His saving work. However, the principal differences between the churches have to do with such teachings as sanctification, Baptism, the Lord's Supper, the gifts of the Holy Spirit (Baptism of the Holy Spirit and tongues), and the end times. It would be difficult adequately to discuss the differences that exist in these areas in brief. I would suggest you consider attending one of our adult information classes to learn what the Lutheran church believes on the basis of its understanding of the Scriptures. Being familiar with the teachings of the Assemblies of God (and Pentecostalism), you would be in a good position to compare the teachings between our churches. You should not feel under any prior obligation to accept or commit yourself to what is being taught; the purpose of the class is to help you on the basis of the Bible to judge for yourself whether what the Lutheran Church teaches is grounded in all that it teaches. I have found the Assemblies of God official website very helpful in summarizing their teaching, and, if you have not looked at this site, you also may find it helpful. Finally, let me call your attention to two reports our Commission on Theology and Church Relations prepared in the 1970s: The Charismatic Movement and Lutheran Theology (1972) and The Lutheran Church and the Charismatic Movement (1977). Since Lutherans and Pentecostal churches have differing understandings of the Holy Spirit's work and gifts, you may find these reports useful. Read more information on the Lutheran view. QUESTION: What are the major differences in doctrine between Baptist churches and The Lutheran Church—Missouri Synod (LCMS)? ANSWER: While unlike the LCMS, Baptist churches do not require subscription to a creedal statement or "body of doctrine" as such. However, one of the major doctrinal differences has to do with what the Bible teaches about Baptism and the Lord's Supper. Lutherans regard Baptism and the Lord's Supper as divinely instituted sacraments. Our confessional writings describe them as the Gospel in "visible" form. They are, therefore, at the heart and center of the Lutheran faith. Baptist churches do not regard Baptism as a means of grace through which the Holy Spirit works to create and strengthen faith. Therefore, they reject infant Baptism. They also place great emphasis on the mode of Baptism (immersion required). Likewise, the Lord's Supper is generally regarded by Baptists as merely a commemorative meal, not a sacrament in which the body and blood of Christ is truly present in and with the bread and wine for the forgiveness of sins. Baptist churches also typically stress the role of "free will" in conversion, and (accordingly) speak of faith in Christ as being attained through a person's "choice" or "decision." Lutherans, on the other hand, believe that faith itself is a gift of God's grace and is brought about not by the "free will" of human beings but by the power of God's Spirit working through God's means of grace, the Word and Sacraments. For more information, see FAQs on Salvation. QUESTION: What are the theological differences between the LCMS and the Episcopal Church? ANSWER: While there are a number of significant theological differences between the LCMS and the Episcopal Church (e.g., the issue of authority in the church, especially as it relates to the doctrine of Scripture as the inspired and inerrant Word of God; the nature of the sacraments as means of grace; the precise understanding of the doctrine of justification; the question of what it means to be a "confessional" church), perhaps the most obvious difference has to do with the Episcopalian view of apostolic succession (which pertains equally to more "conservative" offshoots from the Episcopal church). Episcopalians attach great important to the theory of the apostolic succession. They insist that the apostles ordained bishops, these in turn ordained their successors, and so down through the centuries, so that the present-day bishops are the successors of the apostles through an unbroken chain. Scripture knows nothing of such a theory. Episcopalians hold that only bishops who have received their authority in this way can properly ordain ministers and that without such Episcopal ordination a minister cannot validly perform the sacraments. For more information about denominational differences, you may read Churches in America by Thomas Manteufel, available from Concordia Publishing House (800-325-3040 or cph.org). QUESTION: What are the main differences between the LCMS and the Evangelical Free Church? ANSWER: While we are not aware of any material that compares the teachings of the Evangelical Free Church of America (EFCA) and the LCMS, perhaps these few observations will be helpful. Please note there is no formal statement of differences between the LCMS and the EFCA available, since we have had no formal contacts or discussions with the EFCA. The Evangelical Free Church of America revised its 1950 Statement of Faith, adopting a new Statement of Faith in 2008. The new Statement and additional explanations and resources are available at http://go.efca.org/resources/document/efca-statement-faith. Although statements of this kind are generally very brief and do not delineate precisely what is meant on topics that are traditionally disputed, it is possible to make some evaluative comments. It is clear from the statement itself, first of all, that there would be a substantial amount of doctrinal agreement between our churches regarding core teachings, such as the doctrine of Holy Scripture, God, salvation, the church as the body of Christ, and the resurrection. At the same time, however, those committed to Lutheran confessional doctrine would want to seriously question certain points in this statement. The notes state that the EFCA position allows for both a memorial view of the Lord’s Supper, as well as a “spiritual presence” view, both views that deny the Real Presence of Christ in the Supper. The Lutheran church teaches that Christ’s Body and Blood, according to His word and promise, are truly present in the Lord’s Supper (Matt. 26:26-28; 1 Cor. 10:16; 1 Cor. 11:27). On the basis of scriptural teaching regarding these two Sacraments (not mere “ordinances”), Lutherans have held that they are “means of grace.” That is to say, they are divinely appointed vehicles through which the salvation procured by Christ is conveyed to people (Titus 3:5; Matt. 26:26-28) — just as the spoken Word of the Gospel is a divine means of conveying God’s grace and forgiveness to people (Rom. 1:16-17). The EFCA, along with many evangelicals, seems to hold to a view of these Sacraments that we would find contrary to biblical teaching. Point 9 of the EFCA Statement refers explicitly to their premillennial view of the end times. This stands in strong contrast to the Augsburg Confession, which expressly rejects millennialist teaching (Article XVII). You might find the 1989 CTCR report on The End Times to be helpful on this topic, especially the chart at the end of the report. From a Lutheran perspective what may be regarded by some as non-essential or acceptable positions may in fact directly impinge on the biblical Gospel or biblical truth. For example, the denial of infant baptism in some circles is sometimes dismissed as a point on which differences must be permitted, when in fact in most cases fundamental understandings of the nature of sin, the means of grace, faith, etc. are at issue. QUESTION: What are the main differences between the Methodist and Lutheran denominations? 2. Even Methodist churches of the same denomination often differ to some degree in their theology and practice, since Methodist churches, as a rule, tend to be more concerned with "deeds" than "creeds." Therefore, one might say the most fundamental difference between Lutheran and many Methodist churches is that the Lutheran church is a confessional church (i.e., it binds itself and its member congregations to a specific, formal confession of faith) while the Methodist church, in its varied forms, tends not be as concerned with formal "confessions" of faith to which its congregations must subscribe. The primary differences between Lutheranism and "classical" Methodism rooted in the theology of John Wesley center in Wesley's doctrine of salvation. Wesley taught, contrary to Lutheran theology, that 1) man is free not only to reject salvation but also to accept it (free salvation) by an act of human will; 2) all people who are obedient to the Gospel according to the measure of knowledge given them will be saved (universal salvation); 3) the Holy Spirit assures man of his salvation directly, through an inner "experience" (sure salvation); 4) Christians in this life are capable of Christian perfection and are commanded by God to pursue it (full salvation). Wesley also held to a "symbolic" view of the sacraments in contrast to the Lutheran view of the sacraments as real and powerful means of grace. Lutheran Cyclopedia, edited by Erwin Lueker, Concordia Publishing House (CPH), page 154, on "Methodist Churches"; American Churches: Beliefs and Practices, by F. E. Mayer, CPH, 1956; The Religious Bodies of America by F. E. Mayer, CPH, 1961. QUESTION: Are Mormons generally regarded as Christians, and how do their beliefs differ from those of the Missouri Synod? ANSWER: The Lutheran Church—Missouri Synod, together with the vast majority of Christian denominations in the United States, does not regard the Mormon church as a Christian church. That is because the official writings of Mormonism deny fundamental teachings of orthodox Christianity. For example, the Nicene Creed confesses the clear biblical truth that Jesus Christ, the second Person of the Trinity, is "of one substance with the Father." This central article of the Christian faith is expressly rejected by Mormon teaching — thus undermining the very heart of the scriptural Gospel itself. In a chapter titled "Jesus Christ, the Son of God: Are Mormons Christian?" the president of Brigham Young University (Rex Lee, What Do Mormons Believe? [Salt Lake City: Deseret Book, 1992] summarizes Mormon teaching by stating that the three persons of the Trinity are "not ... one being" (21), but are "separate individuals." In addition, the Father is regarded as having a body "of flesh and bone" (22). Such teaching is contrary to the Holy Scriptures, destructive to the Gospel of Jesus Christ, and indicative of the fact that Mormon teaching is not Christian. For more information about beliefs of The Church of Jesus Christ of Latter-Day Saints read this document prepared by the Commission on Theology and Church Relations. QUESTION: What are the main differences between the Missouri Synod and the Pentecostal churches? ANSWER: Perhaps the main difference between The Lutheran Church—Missouri Synod and Pentecostal churches is that Pentecostal churches tend to emphasize the importance of personal and spiritual "experiences" (such as "Baptism in the Holy Spirit" and speaking in tongues), while the LCMS emphasizes the importance and centrality of the word and promises of God in Holy Scripture, which remain true and valid regardless of our personal "feelings" or "experiences." To learn more about the LCMS view of Scripture and its most important teachings, see What Do Lutherans Believe and What About...the LCMS? QUESTION: What differences are there between the Missouri Synod and the Church of the Nazarene? ANSWER: While Lutheran theology strongly emphasizes the importance of good works and holy living as fruits of a true and living faith in Jesus Christ, Lutherans also believe that the Bible teaches that Christians will not be “entirely sanctified” and totally free of sin until they reach their home in heaven. And issues relating to the proper distinction between the Law and the Gospel in Holy Scripture. To learn more about the LCMS view of Scripture and its most important teachings, see What Do Lutherans Believe and What About ... the LCMS? QUESTION: How does the Missouri Synod differ from the Presbyterian Church? ANSWER: As is the case with most mainline denominations today, there are specific issues such as the ordination of women, abortion, homosexuality, etc., that divide the distinct Presbyterian church bodies — for example, the Presbyterian Church in the USA (PCUSA) and the more conservative Presbyterian Church in America (PCA). 1. The centrality of the Gospel. Presbyterian churches tend to emphasize the "glory" or "sovereignty" of God as the central teaching of Scripture, while Lutherans believe that the central teaching of Scripture — and the key to understanding and interpreting the Bible — is the Gospel: the Good News of Salvation for sinners by grace alone through faith alone in Christ alone. 2. The nature of Christ's atonement. Lutherans believe that when Jesus died on the cross He atoned for the sins of all people of all time — even those who have not or will not come to faith in Christ and will spend eternity in hell. Some Presbyterian churches teach a "limited atonement" of Christ, i.e., that Christ's death on the cross atoned only for the sins of "the elect" — those who have been predestined from eternity to believe in Christ and will spend eternity with Him in heaven. 3. Predestination. Most Presbyterian churches teach a "double predestination," i.e., that some people are predestined by God from eternity to be saved and others are predestined by God from eternity to be damned. Lutherans believe that while God, in his grace in Christ Jesus, has indeed chosen from eternity to save those who trust in Jesus Christ, He has not predestined anyone to damnation. Those who are saved are saved by grace alone; those who are damned are damned not by God's choice but because of their own sin and stubbornness. This is a mystery that is incomprehensible to human reason (as are all true Scriptural articles of faith). 4. The authority of Scripture. A fourth difference has to do with the proper use of reason and its relationship to the authority of Scripture. Lutherans look to Scripture alone as the source of all Christian doctrine, and we hold to the teachings of Scripture even when they are incomprehensible to human reason. Some Presbyterian churches tend to place human reason alongside Scripture as a source of doctrinal authority, and they seek to bring seemingly paradoxical Scriptural truths into harmony with human reason in ways that (in our view) undermine the truthfulness and authority of Scripture. 5. The Sacraments. Most Presbyterian churches (to a greater or lesser degree) view the Sacraments of Baptism and the Lord's Supper merely as "signs" or "symbols" of God's grace. Lutherans believe Baptism and the Lord's Supper (which is the true body and blood of Christ in, with, and under bread and wine) are actual means of God's grace through which the Holy Spirit works to convey and/or strengthen faith. A more detailed discussion of the differences between Lutherans and Calvinist churches may be found in Churches in America by Thomas Manteufel, available from Concordia Publishing House in St. Louis (800-325-3040 or cph.org). QUESTION: What are the major differences between the Missouri Synod and Reformed churches? ANSWER: Just as there are many significant differences in theology and practice between Lutherans of varying denominations, the same is true when it comes to different churches within the Reformed tradition. Differences exist among Reformed churches even regarding such fundamental issues as the authority of Scripture and the nature and centrality of the doctrine of justification. Historically, however, most Reformed churches adhere to the five points of Calvinist theology commonly summarized by the acrostic "tulip" as these were set forth at the Synod of Dort (1618-19). On page 41 in his book, Churches in America, Dr. Thomas Manteufel reviews these five points and explains how they compare and/or contrast with what Lutherans believe regarding these matters. I (Irresistible grace) We agree that God makes us alive by His mighty power, without our aid (Eph. 2:5; John 1:13). But Scripture warns we can resist God’s gracious call (Matt. 23:37; Acts 7:51; 2 Cor. 6:1). And some people do resist God’s grace, or all would be saved (1 Tim 2:4). Furthermore, God warns us not to resist His grace (2 Cor. 6:1; Heb. 4:7). Churches in America by Dr. Thomas Manteufel; p. 41 (St. Louis: CPH, 1994). For more information about the Reformed Church as well as other denominations in the United States, you may contact Concordia Publishing House in St. Louis at 800-325-3040 or cph.org and ask for Churches in America, by Thomas Manteufel, stock no. 22-2522. QUESTION: What are the main theological differences between the theology of the Lutheran Church and the Roman Catholic Church? Lutherans believe Scripture alone has authority to determine doctrine; the Roman Catholic Church gives this authority also to the pope, the church, and certain traditions of the church. 2. The doctrine of justification. Lutherans believe a person is saved by God's grace alone through faith alone in Christ alone. The Roman Catholic Church, while at times using similar language, still officially holds that faith, in order to save, must be accompanied by (or "infused with") some "work" or "love" active within a Christian. 3. The authority of the pope. Unlike the Roman Catholic Church, Lutherans do not believe the office of the papacy as such has any divine authority or that Christians need to submit to the Pope's authority to be "true" members of the visible church. 4. Differences remain about both the number and the nature of the sacraments. Roman Catholics speak of seven Sacraments while Lutherans tend to speak of only two (or three). More important than number is how the Sacraments are understood. To take a single example, Lutherans believe that in the Sacrament of the Altar (Communion) Christ’s body and blood are truly present in the bread and wine of the Lord’s Supper, but they do not accept the Roman Catholic doctrine of transubstantiation, which teaches that the elements are permanently changed from the substances of bread and wine to the substances of body and blood. Transubstantiation is rejected for several reasons: It is a philosophical explanation for a work of Christ’s almighty Word which we can only believe, not explain. In seeking to explain a mystery it changes the plain and simple meanings of God’s Word (Scripture refers to the elements as both bread and wine and body and blood, 1 Cor. 11:26-27). Transubstantiation leads to the assertion that the body and blood of Christ remain present “even apart from the administration of the Supper” and so encourages veneration of the elements apart from their sacramental use and detracts from the use Christ commands: “Take eat … drink … for the forgiveness of your sins.” Lutheran rejection of transubstantiation should not in any way be taken to mean a denial that Christ’s very body and blood are truly present in the bread and wine of the Lord’s Supper for the forgiveness of sins. 5. Differences remain about the role of Mary and the saints. Unlike Catholics, Lutherans do not believe it is proper or scriptural to offer prayers to saints or to view Mary as in any sense a "mediator" between God and human beings. While Lutherans believe any doctrinal error has the potential to distort or deny Scripture's teaching regarding salvation, we also believe that anyone (regardless of denominational affiliation) who truly believes in Jesus Christ as Savior will be saved. QUESTION: What's the Lutheran response to the Roman Catholic teaching of purgatory? ANSWER: Lutherans have always rejected the traditional Roman Catholic teaching regarding purgatory because 1) we can find no scriptural basis for it, and 2) it is inconsistent, in our view, with the clear teaching of Scripture that after death the soul goes directly either to heaven (in the case of a Christian) or hell (in the case of a non-Christian), not to some "intermediate" place or state. In the moment of death the souls of the believers enter the joy of heaven. Jesus said to the malefactor: "Today shalt thou be with Me in paradise" (Luke 23:43). Stephen said in the hour of death: "Lord Jesus, receive my spirit" (Acts 7:59). Whoever dies in the Lord is blessed "from henceforth" (Rev. 14:13). QUESTION: A non-Lutheran Christian friend of mine recently stated he believes Catholics are not saved and should not be considered Christians. What is the Synod's belief regarding the salvation of Catholics who adhere to Roman dogma? ANSWER: The LCMS recognizes all Trinitarian church bodies as Christian churches (in contrast to "cults," which typically reject the doctrine of the Trinity and thus cannot be recognized as Christian). In fact, a primary "objective" listed in the Synod's Constitution (Article III) is to "work through its official structure toward fellowship with other Christian church bodies" — which explicitly assumes that these "other church bodies" are "Christian" in nature. That does not lessen the Synod's concern for the false doctrine taught and confessed by these churches, but it does highlight the Synod's recognition that wherever the "marks of the church" (the Gospel and Sacraments) are present—even where "mixed" with error—there the Christian church is present. Such a church is a heterodox church, that is, a church that teaches false doctrine. Of course, personal salvation is not merely a matter of external membership in or association with any church organization or denomination (including the LCMS), but comes through faith in Jesus Christ alone. All those who confess Jesus Christ as Savior are recognized as "Christians" by the Synod—only God can look into a person's heart and see whether that person really believes. It is possible to have true and sincere faith in Jesus Christ even while having wrong or incomplete beliefs about other doctrinal issues. This explains why former Synod President A.L. Barry called members of the Roman Catholic Church "our fellow Christians" in his statement Toward True Reconciliation, which at the same time identifies and laments the false teachings of the Roman Catholic Church. The great danger is that believing things contrary to God's Word can obscure and perhaps even completely destroy belief in Jesus Christ as one's Savior. We pray this will not happen to those who confess Jesus Christ as Savior and yet belong to heterodox church bodies, including fellow Christians in the Roman Catholic Church. ANSWER: While The Lutheran Church—Missouri Synod holds Martin Luther in high esteem for his bold proclamation and clear articulation of the teachings of Scripture, it deeply regrets and deplores statements made by Luther which express a negative and hostile attitude toward the Jews. In light of the many positive and caring statements concerning the Jews made by Luther throughout his lifetime, it would not be fair on the basis of these few regrettable (and uncharacteristic) negative statements, to characterize the reformer as "a rabid anti-Semite." The LCMS, however, does not seek to "excuse" these statements of Luther, but it denounces them (without denouncing Luther's theology). In 1983, the Synod adopted an official resolution addressing these statements of Luther and making clear its own position on anti-Semitism. "Some say that the existence of denominations within Christ's church is a tragedy caused by sin and immaturity; others claim that denominations are a blessing, since they produce diversity within the body of Christ." What do you think? ANSWER: Since apostolic times visible Christendom has been divided. Although there are historical, cultural, and sociological factors that have contributed to such division, departure from God's truth revealed to us in the Holy Scriptures must be regarded as the principal cause for such division. The apostles themselves foresaw and had to deal with such division within early Christian communities (see, for example, Acts 20:25-31). While the Scriptures are the inerrant source and norm of all doctrine and while God's Truth is one, sinful human beings can and do err. Hence, division occurs in visible Christendom. The same can be said for modern denominationalism. While there are historical, cultural and sociological factors involved in the formation of denominations, disagreement regarding the understanding and application of biblical doctrine remains the fundamental reason for division between and among them. We hold that there can be only one Truth, and that denominations exist because some Christians have departed from what is faithful to biblical doctrine. In spite of the divided state of Christendom, we in The Lutheran Church—Missouri Synod remain committed to the quest for external unity in the church based on agreement in doctrine. We believe that this is not an option, but is God's will.